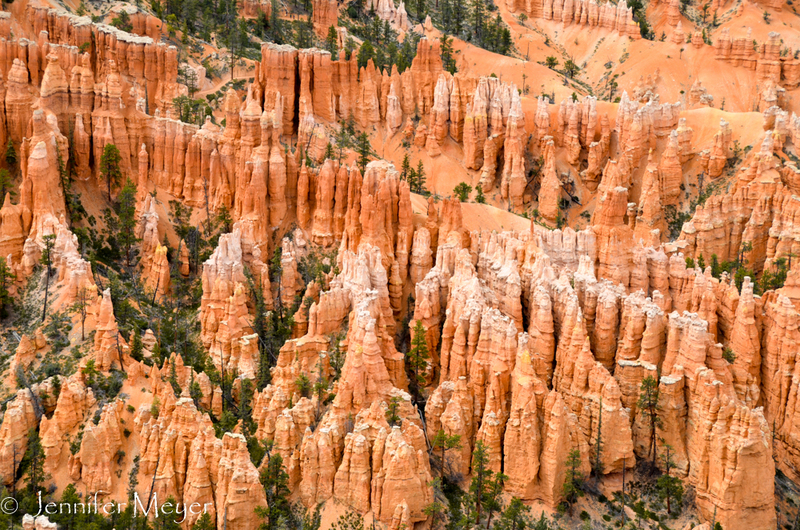 Bryce Canyon is a high elevation park (over 9,000 feet in some places), so it’s always much colder than Zion. Still we were surprised to learn that snow was predicted. So strange after dressing in shorts and sandals for the last few weeks. We arrived at the park shortly after noon and found a site in North Campground suitable for both us and our friends. After a short hike along the canyon rim, Kate and I settled in to wait for the snow. Snug in Bessie with mugs of tea and fuzzy throws, it was thrilling to watch the first dry hard flakes rise to a hearty blur that frosted the park in white. The snow didn’t last, but the cold did. When the sun peeked out after dinner, Hilary and I ran off to take some photos of the canyon. 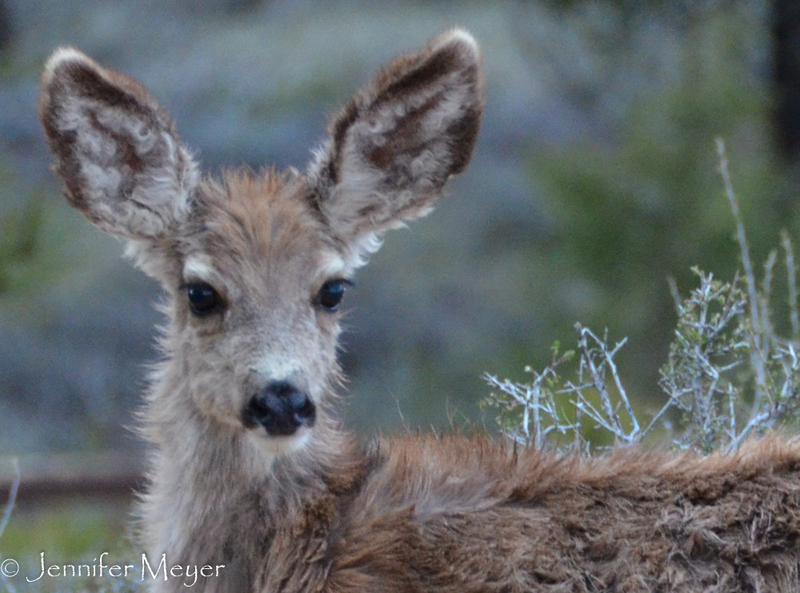 It was a tepid sunset, but we did get some shots of deer crossing our path. The snow came back during the night, and when I woke just before dawn, I lifted the curtains to see a good two inches on the ground. 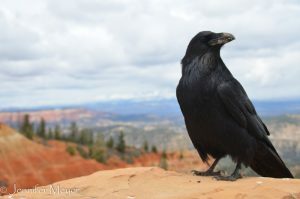 Remembering what Anita had read the night before about Bryce Canyon being best at dawn, I grabbed Bailey and took off for Sunrise Point. It was still snowing, though, and there was no sunrise to see. Only snow on firs and hoodoos, and the little fawn we’d seen the night before. Unlike Zion, where you can hop on and off shuttles to get to all places of the park, Bryce just has shuttles for the north end of the park. To see the rest of the park, you have to drive to overlooks and trailheads. By afternoon, the snow had stopped. After lunch in the beautiful old lodge, we all took off on a “drive ‘n click” tour of the rest of the park. The weather changed from minute to minute. Sometimes sunny with dark purple skies threatening more snow. Sometimes windy and bleak. 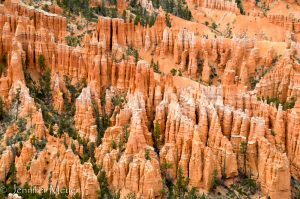 In better weather, I would have loved to hike down into the lower canyon and peer up at the pointed red hoodoos towering around me. But between the frigidity and the sluggish effects of the elevation, I just wasn’t feeling it. Still, viewing it from above is a stupendous sight, and getting to see the canyon covered in snow was extra special. Anita and Hilary with Bailey. That night we wound up our 10-day trip with Anita and Hilary with one last dinner together. We were so happy to have them drive out and join us for a leg of this trip, and it was hard to say goodbye, imagining that we won’t see each other for another year. They were the ones who gave us the idea for this road trip in the first place. 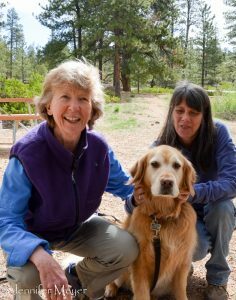 When they retired, they talked about traveling in their VW van for a year. That seemed crazy to us at the time, but when they switched plans to a year abroad and we watched them empty their house and rent it, then fly off to France for a string of adventures, we came to realize that maybe that really is a thing people can do. So we feel indebted to Anita and Hilary for leading the way. Nice to see a spotlight on Anita and Hilary who gave you this crazy idea to travel a year! I need to thank them both… since we are getting to see you soon! YAY!